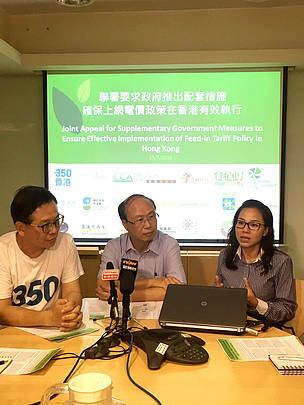 The government announcement of feed-in tariffs (FiT) for renewable electricity from wind and solar is a positive step for Hong Kong. In order that Hong Kong can meet its obligations under the Paris Climate Agreement as one of the most developed cities in the region, it is essential that the proportion of renewable energy in electricity generation be scaled up quickly and that as many stakeholders as possible be encouraged to participate in the production of clean electricity. To achieve these objectives, we appeal to the Hong Kong government to implement the following policy measures with the support of all relevant policy bureaus and departments. As currently proposed, the fixed termination date of FiT payments at 2033 would serve as a disincentive to investors in RE systems. If the fixed term of the scheme of control for the two utilities is an impediment to the extension of FiT beyond 2033, we urge the government to make a public undertaking that it will make a best effort to negotiate with future electricity utilities to ensure that FiT will last for 20 years at the same rate commencing from the date of acceptance of the RE installation into the power grid and act as a backstop if negotiations are not fruitful. The legality of a canopy of solar panels under Building regulations is unclear for many residents and building owners. We urge the Buildings Department to issue clear guidelines to remove such uncertainties and to amend certain restrictions. The government may take reference from the experience in Seoul or Taiwan. For instance, one of the options is to allow solar panels to provide shade for a certain proportion of rooftop or terrace areas, and modifying height restrictions of 1.5m for solar panels to a suitable level that may allow the areas be used for shading. The flat surface of various types of public space, such as open areas in public housing estates, public parks, sports stadiums and water reservoirs, are important public assets which may offer good potentials for RE installations without affecting existing functions. We urge government to release smaller sites such as those at public parks or public housing estates for RE installations by social business incorporated or invested by local communities, and to open up larger ones for companies to bid for the right to install and operate solar farms. This will require high-level coordination at senior level and the active participation by relevant departments responsible for the management of these public space. Since the high capital requirements for RE installations may be an impediment to potential investors, we urge the government to provide additional funding support to community projects, such as RE installations at facilities run by NGOs, social business incorporated by local residents, or professional training for RE installers. These funding may be mobilised from different sources, such as proceeds from the $100 billion green bonds to be issued by the government, or from government matching grants linked to the sales revenue of RE certificates. The current policy provides no guidance on whether or how RE installations larger than 1 MW may benefit from FiT, which is a disincentive for investors. 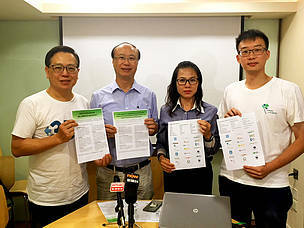 We urge the government to set out clear guidelines on FiT level for large installations, including renewable energy sources other than solar and small scale wind power. The FiT level may be fixed by assuming a payback period of less than 10 years. In order to take full advantage of the new policy, we sincerely request the government to study and announce these supplementary measures as soon as practicable, preferably before the implementation of FiT in October 2018.